The details are what give this set a much-loved classic look that will help create a warm, cozy nursery for your little treasure. We 'd all love for them to stay babies forever but they 'll grow fast (as we all know!). So we created kid 's room furniture for the same collection: when baby is older, just complete the room by adding more pieces to what you have. Love it! This country style changing table features rounded contours for your baby 's safety and comfort. This practical changing table goes really well with the look you've always wanted for your little sweetie's room. We designed it for moms-to-be who would like soothing pastel tones in a nice calm setting, or a lot of colour with a touch of fantasy. Only your imagination is holding you back! This item comes with a 5- year quality guarantee. Can be combined with items of this collection. The Angel collection changing table in Espresso finish has been designed with baby's safety in mind, and so parents have easy, close at hand access to baby care products. The two spacious open storage spaces will easily fit all necessary baby care products. Pair it with a South Shore Espresso crib to create a stylish and practical room. It is also available Royal Cherry finish. For complete interior dimensions, see spec sheet. It meets or exceeds all US Consumer Product Safety Commission Standards and conforms to ASTM standards as well (ASTM F2388). The weight of the child should not exceed 30 pounds. It measures 34-3/4-inch wide by 19-1/2-inch deep by 35-1/2-inch high. It is delivered in a box measuring 41-1/2-inch by 20-3/4-inch by 5-1/4-inch and weighing 68 pounds. This crib is designed to not only provide maximum safety for your baby but to be in line with today's trends as well. The Nautical-themed baby crib set included comes in soft colours. A unisex comforter, bed skirt and sheet offer a complete solution for your baby's room. You'll be amazed at the style and functionality of this simple transitional changing table from the Cotton Candy collection. The drawers with their profiled edges, the attractive legs, and the wooden knobs will add a touch of pizzazz to baby's room, while also providing you with the storage space you need for diapers and wipes. This versatile, timeless piece is a smart, economical choice, since your child can use it for years to come! 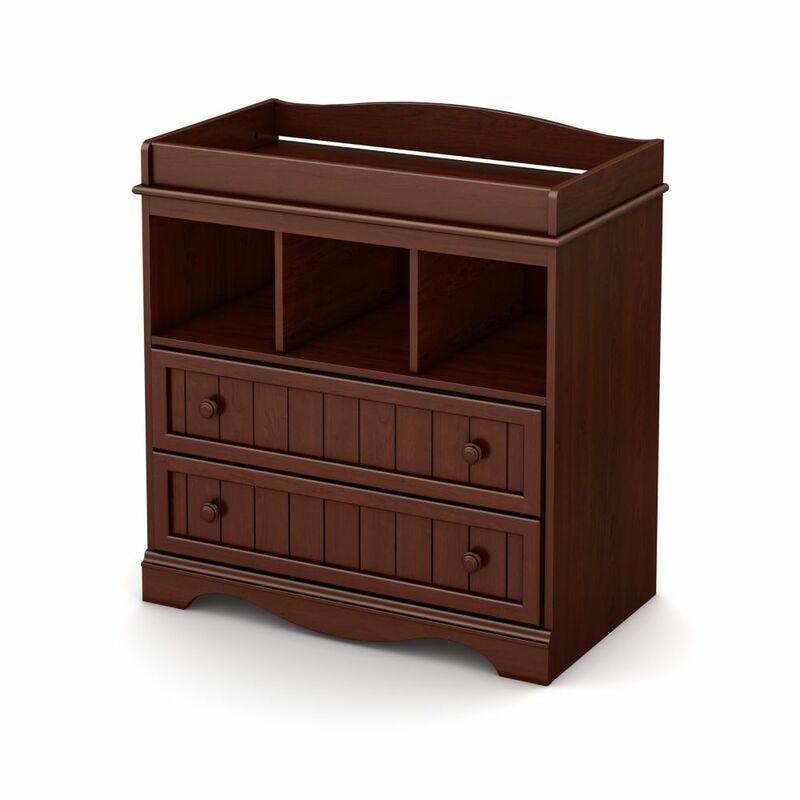 Savannah Changing Table, Royal Cherry The details are what give this set a much-loved classic look that will help create a warm, cozy nursery for your little treasure. We 'd all love for them to stay babies forever but they 'll grow fast (as we all know!). So we created kid 's room furniture for the same collection: when baby is older, just complete the room by adding more pieces to what you have. Love it! This country style changing table features rounded contours for your baby 's safety and comfort.